My family enjoys being outdoors and we like to be in good physical shape, too. So, it makes sense that we would love to hike. What’s better than being outdoors, enjoying nature, feeling the weather and staying in great shape? 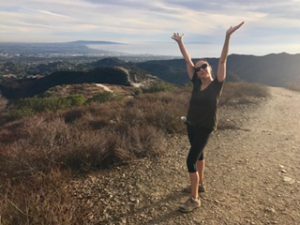 What’s even better is a hike that’s great for the mind and the heart. When you’re stressed or feeling down, a long hike can make it all go away. 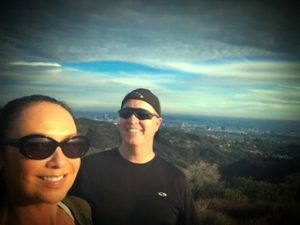 We discovered The Westridge Trail, a trail that’s not only good for the head and heart, but a hike for the soul. This invigorating trail is 7.4 miles round trip, with an elevation gain of 730 feet. 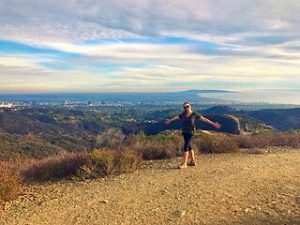 Located inside of Westridge-Canyonback Park on San Vicente Mountain and part of the Santa Monica Mountain range. 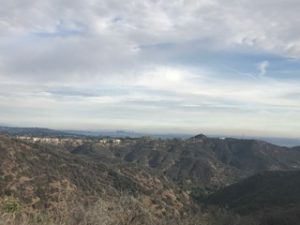 It has more than 1,500 acres of open space and borders Mandeville Canyon and Sullivan Canyon. The park can be entered from West Los Angeles and San Fernando Valley. 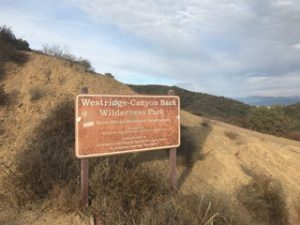 You will find a fire road in Westridge Canyonback park called Westridge Fire Road and it provides access to hikers, bikers and horseback riders. 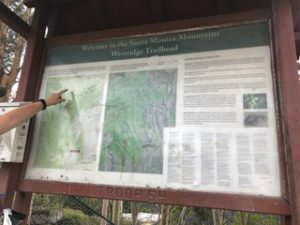 This fire road is also known as Westridge Trail. 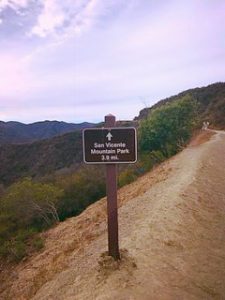 The Trail runs along the north-south ridge line of San Vicente Mountain. 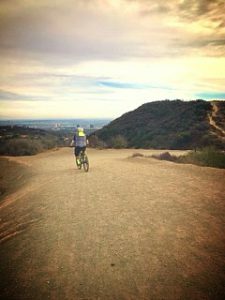 The West Los Angeles entrance of this trail is in the exclusive neighborhood of Brentwood. There’s a small parking lot at the end of Mandeville Canyon Road, which is off of Sunset Boulevard. The lot is quite small. Luckily, there’s plenty of parking on the street. The trail starts with a gradual climb, heading north, weaving along the west side of the ridge. 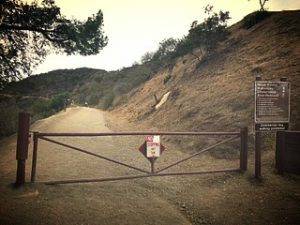 If you’re coming from the San Fernando Valley, you can access the trail from San Vicente Mountain Park. From the 405 freeway, take Mullholland Drive west for 2.7 miles, to the end. You’ll walk about 10 minutes on a fire road before you find the start of the trail. The trail starts by going downhill. You will return going uphill. Why do I say this hike is good for the soul? Easy, the views. There is something about being able to see the ocean that makes you reach down inside and makes you feel rejuvenated. 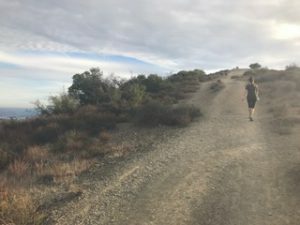 This trail has such beautiful sights, from the Pacific Ocean, to the rolling hills, to the San Fernando Valley, to the City of Angels. The magical views makes you breathe in and absorb the surroundings right into your soul, while hiking vigorously. Hiking vigorously? Did I just lose you? Not to worry, you can hike as much as you want. While the hike can be a moderate to difficult 2 hours, you can hike for 20 minutes and it’ll be easy. You’ll see and feel your surroundings from almost everywhere. I saw families with little kids and teenagers with their dogs, all on this trail. There isn’t much shade on this trail, don’t forget to bring plenty of water. Should you choose to do the round trip hike, be sure to give yourself plenty of time. When you’re at the top of San Vicente Mountain, you’ll find something interesting to explore. You’ll discover an old Nike missile defense site with a lookout tower. The site was used during the coldwar to detect Russian missiles aimed towards Los Angeles. Luckily, the site was kept in tact. So, be sure to check it out, while you’re taking a breather. 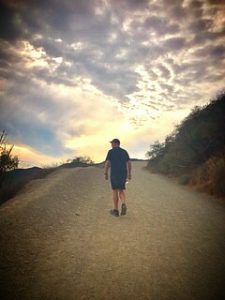 Every hike you do is good for your body and mind. But, a nice hike can be healing, too. I suffered a loss recently and this hike helped me to reflect on my life, helped me to know that life goes on, helped me to know that this world is still beautiful, even through sorrow. 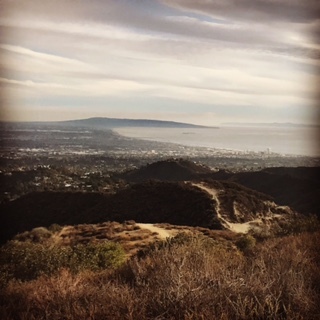 Yes, I’m lucky to live in California, but wherever you may live, there’ll be that time, when that hike will not only be good for your head and your heart, but will be especially good for your soul. So get out there and hike. Thank you dad for teaching me to love the outdoors. I’m still outside, I’m still loving it.